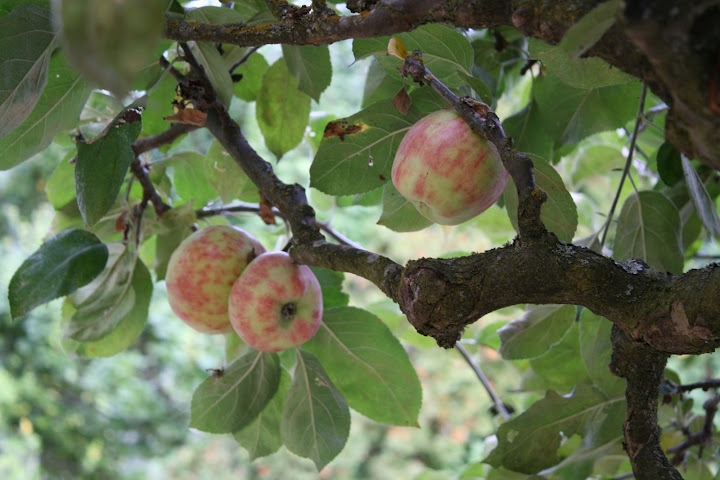 The kitchen is sweet with the smell of apples, big yellow pie apples, light in the hand, their skins freckled, the stems knobby and thick with bark, as if the tree could not bear to let the apple go. always better with machines, is standing at the apple peeler; my grandmother, more at home with a paring knife, faces her across the breadboard. the apple that swivels the blade pressed tight against the apple's side and peels the skin away in long curling strips that twist and fall to a bucket on the floor. Are winding staircases, little accordions, slinky toys, jack-in-the-box fruit, until my grandmother's paring knife goes slicing through the rings and they become apple pies, apple cakes, apple crisp. Soon they will be married to butter and live with cinnamon and sugar, happily ever after.